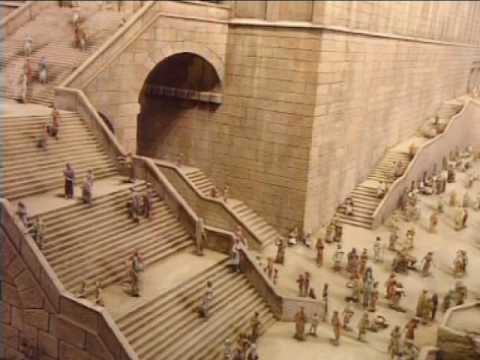 Jerusalem, ‘Aelia Capitolina’’, a typical Roman city with pagan temples and imperial statues. The exhibit presents, among other things, the story of the revolt led by Bar Kochba (132 CE) and the strict prohibition against Jews’ settling in the city. The longing for renewed Jewish independence persisted after the destruction of the Second Temple (70 CE). The Bar Kochba revolt (132 to 135 CE) was one of the failed attempts to restore Jewish sovereignty in Jerusalem. From their hiding places in the Judean caves, the insurgents minted rebellion coins onto existing Roman coins and engraved them with the façade of the Temple and the inscription “Jerusalem”. Silver coin with the façade of the Temple and the inscription “Jerusalem” – a symbol of Bar Kochba’s and his followers’ aspirations (132-135 CE). Enlarged replica, courtesy of the Israel Museum, Jerusalem. Hadrian, among the most enlightened of Roman emperors (117-138), turned Jerusalem into a Roman colony known as Aelia Capitolina. A temple for Jupiter was built on Temple Mount and all traces of Jewish life in the city were completely erased during this period.